It also includes some useful dosing and user guidelines. Basically this is the most simplest and safest way to supplement individual trace elements and you will bumping up certain parameter above the natural sea water level to get more kick out of the corals. This will ensure your “LITE” elements are not going to be depleted. It seems corals loose color or pale out when certain trace elements are reaching a very low level, that is the purpose of this method to avoid this scenario. You will do only correction dosages based on ICP results, hence no overdosing will happen. You simply will only dose what is measured below the desired Target levels for the elements in the “LITE” category. This is done after the ICP test. The Moonshiner calculator will be used to determine how much liquid is needed to be dosed. Typically you start with a monthly ICP. Since the target levels are a bit higher, within a month or even two or more, the LITE elements do not deplete very fast, hence depending on the first few months results, you will see how much they drop and if you can continue with a bi monthly testing. You will enjoy the fact of reduced testing with your home kits, where you don’t have to struggle with testing of Potassium and Strontium which are extremely critical for color and growth and the test kits are a pain and very inconsistent on the readings. What ICP test to use? I recommend to use ATI tests for now personally since they also test for Fluoride and Nitrate. As well the postage is included to the lab. In addition I like the trending diagrams on their website where you can see in graphs how the elements have been progressed. The turnaround until you have the results has been mostly 2 weeks, in a very few cases almost 3 weeks. Actually not really…. , if you do use the Moonshiner calculator and utilize the correct numbers then this is very unlikely. From the time you do send the sample, until you receive the results, there is a bit of depletion that is not accounted for, hence the real level of the elements is a bit lower after the correction dosage than the target level. Can I exceed the Target levels? That’s the experimental fun part. Partially you can play around with even higher levels than shown in the RM calculator and I hope you guys will share positive or negative results! For certain elements like Boron, I pimped the level up to 10 mg/L with the results of having everything dark cherry red and even my orange in LPS turned red! Well, I did want to have my LPS orange again so I dropped the Boron level back to 6-7. A few elements have however highest levels, where it has negative effects or even damage on corals if you exceed them. Fluoride shall never be higher than 1,9-2,0 mg/L, otherwise you have damage on the tissue. Bromide seems to make certain red SPS dark brown with no fluorescence if above 100 mg/L etc. So this subject is fun and also dangerous……. 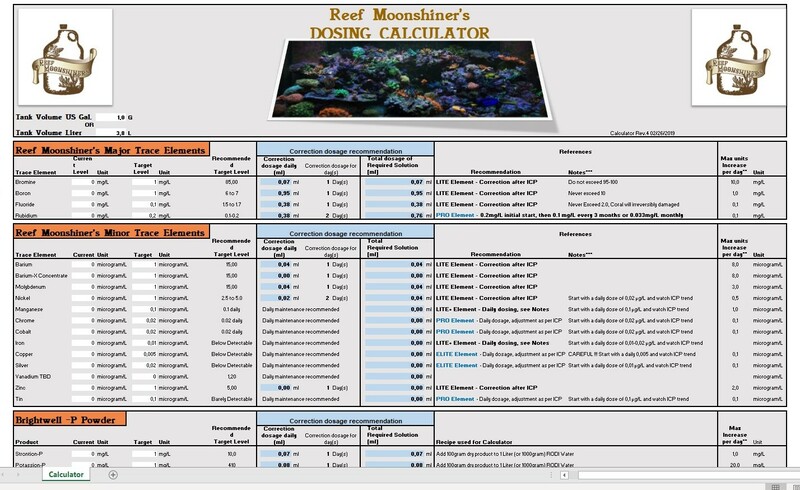 What elements are part of the Reef Moonshiner “LITE” method? What is supposed to be part of the “LITE” method, but Moonshiner is not available for it? Iodine is very crucial and important but also very complex to dose. The easiest way, I personally do use Seachem Potassium Iodide (Seachem Reef Iodide), and dose 1-2 drops of it daily for each 100G system volume. I use Glass dropper bottles, from Amazon for a precise daily dose. Weekly dosages always ended up in overdosing and bleaching, hence I strictly do start with 1 drop per 100G and see what the ICP indicates. If lower than 0.06 mg/L, I simply put one more drop per day into the daily routine. Make sure you start dosing at least a week before the sample to the ICP lab goes out, since Potassium Iodide need some time to show up as Iodine on the test. Not sure if you know this, but Iodide converts to Iodine after a while and not instantly! Water changes will also bring in some Iodide, so keep a steady water change routine and start with less drops and wait for the ICP. Iodine management seems to be difficult but as soon the daily routine is performed and the ICP shows your Iodine where we want it, it is a worry free parameter usually. In case you detect Iodine in good levels at your initial ICP, then leave it alone, you may have good supplementation via your water changes. These 2 elements are depleted always if not supplemented in any way, by skimming and consumed, by all sorts of biological processes in the tank. I always do see a great positive effect in vibrance on all corals, even while not detectable on the ICP tests. That means they are completely consumed within the day of dosing which is fine! Since we dose it, we know it’s been supplemented in some way and small amounts. They can be dosed instantly even without testing. The way it works is you start with a daily small dose the week before the ICP sample will be taken. This has the benefit, that you have on your first initial ICP already an indication if they reached detectable limits. I will have a post in the Moonshiner Support group, that gives an indication how much to start with. Also the Moonshiner calculator has indications for a start dose. For Manganese we keep an eye on the trending as per the ICP results, and as soon it starts to be detectable, you can keep the dose or slightly reduce it. Iron will be the same method, however you will have to look at your yellow and green acros to see if Iron is dosed too much. Keep it barely detectable and you should be good. If Iron dosage is becoming too much, than you see yellow acros turning green. Remember, harvesting algae then will change your Fe and Mn consumption a bit. What else is needed to take care of? a. Make sure ALK,CA and MG is always in good acceptable ranges, otherwise Trace element supplementation doesn’t do much to enhance coloration and growth. c. Avoid too high Calcium levels. There is a ALK/CA ratio and it’s a subject on it’s own to fill a book, however Ca below 430 should be the target! Otherwise with lower ALK and high Ca ratio, you will run into pale coral issues. What if I have exceeded the target levels? Usually simply wait for natural correction of elements that have been exceeded the desired target levels. Investigate which elements keeps creeping up and if it may come in via other supplements or salt mixes if you don’t dose it. Can it be used for Nano tanks? I can’t say not to use it, but it is very tricky to deal with maybe very low dosages of elements in a small Nano tank. Should I do Water Changes? Yes, there are other elements that need to be supplemented such as Tin, Chromium, Cobalt, Copper etc. that will be part of the water change. Even while the ICP doesn’t show anything, it does not mean it’s not supplemented. Recommended is to do a very strict routine of water changes to keep the Element consumption and supplementation controlled and consistent so it does not interfere heavily with the ICP results and tank consumptions. Use the same salt, same amount in the almost the same time sequence. I recommend 10-15% water changes if you do WC’s. DO NOT send out the Water sample to the ICP lab right after the Water changes, better do it at least 1-2 days after the water change! All the above is not set in stone and is only a personal recommendation how I would do the supplementation and I hope it helps everyone.